If you’re installing one of GavickPro’s themes in an existing WordPress installation then you won’t be able to use the quickstart package for easy install; instead, you’ll need to manually install and configure the various theme elements. If you’re aiming to match the demo layout exactly, it helps to have the sample content from the demo installed; it includes the posts, categories, media and menus from the demo content. This is especially useful if you’re going to be following the manual widget placement guide for a theme, as the widget configuration references the demo content. Click on WordPress, as we are going to be importing posts and other content from the demo installation. This will open a pop-up that will allow you to install the WordPress Importer plugin. Read through the description to see what things can be imported; posts, categories, comments, custom fields and more are included. Once ready, click on ‘Install Now’ at the bottom right of the pop-up. WordPress will download and install the plugin package from the WordPress.org repository; once complete, you’ll be given the option of activating and opening the plugin, or returning to the list of importer options. Click on ‘Activate Plugin and Run Importer’. The importer will open, and you will be able to choose an import file. Since we don’t have anything to import yet, you can leave things for now. 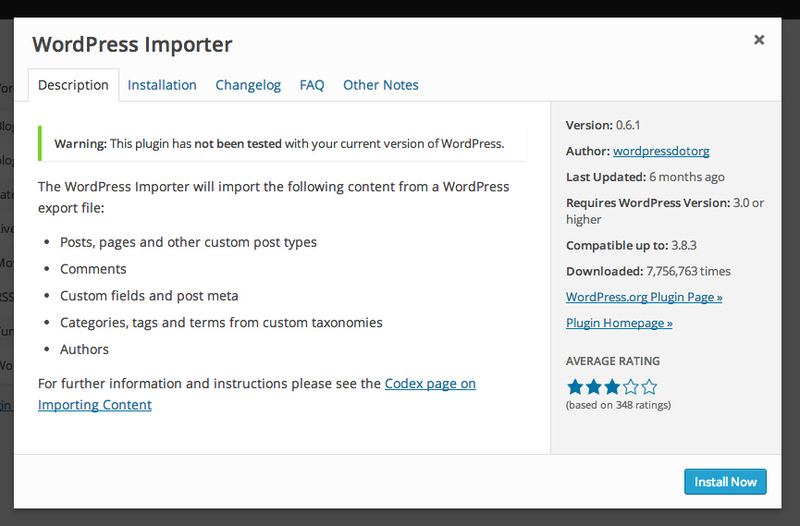 Should you wish to open the importer later, just click on Tools>Import>WordPress. 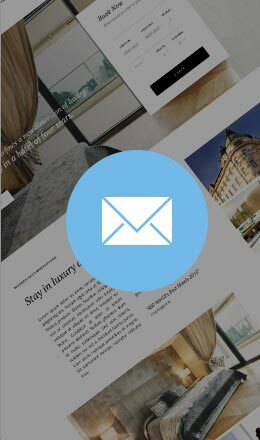 In Safari: Right or control-click on the link and select ‘Download linked file’. This will download a file called theme_name.xml, where “theme_name” is (wait for it…) the theme name. In Chrome: Right-click on the link and select ‘Download link as…’. A dialogue box will open to specify where the download should be saved. The name will default to ‘theme_name.xml’, so just leave this as default and save the file. In Firefox: Right-click on the link and select ‘Save link as…’. A dialogue box will open where you can specify the save location; as with the other browsers the name will default to “theme_name.xml” so leave this as it is. Log-in to your WordPress backend and open your WordPress importer (Tool>Import>WordPress). Click on ‘Choose file’ and select your newly-downloaded theme_name.xml. Click ‘Upload file and import’. 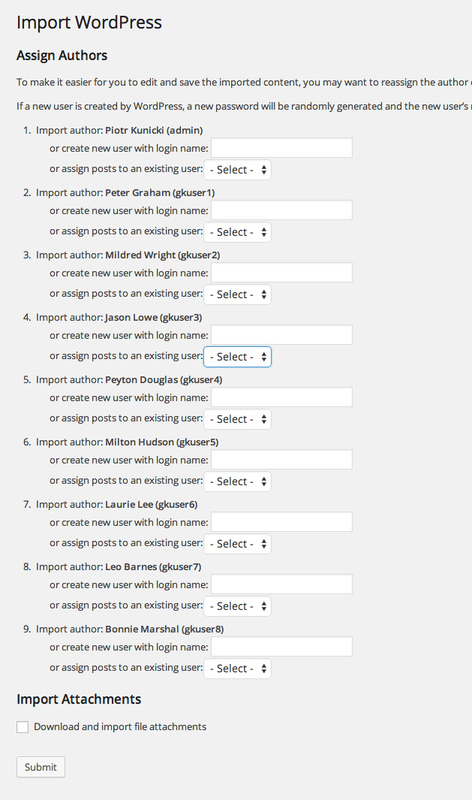 You will taken to the Import WordPress screen with two areas; Assign Authors and Import Attachments. Click the tick-box next to ‘Download and import file attachments’ to include media such as images from the posts in the import. Click the ‘Submit’ button to run the import process. After a few moments, you will receive a confirmation message to say that the process has finished. The demo content will now be available in your WordPress installation, and you can move on to installing and configuring the widgets to match the demo! Part 3 – Importing demo content – You are here!